If you’re a buyer on a tight budget, your family may want to help you out on a home purchase. If that’s the case, lucky you! But, should you or shouldn’t you accept their help? It’s something that many first-time buyers do welcome, especially if coming up with a down payment or qualifying for a lower interest rate is going to delay their dream of home ownership. If you have willing family members who have the finances or who may want to see you enjoy your inheritance now, then it’s worth the time to see if this is a viable financial option for you (and them). The big question is whether it will be a gift or a loan. These are two very distinct options and are handled differently from beginning to end. You and your family members will want to consult with experts on tax law and real estate law so that all the “i’s are dotted” and the IRS won’t be questioning this intrafamily agreement. It’s a Gift — $56,000 tax free! A gift is just that, a present with no strings attached. It’s not a loan at all or even considered income. And you do not have to pay back anyone. Ever. And, yep, you and your spouse could get up to $56,000 in one year. That could be a nice down payment. Parents can each give up to $14,000 to a child and another $14,000 (in 2017, this changes typically annually) each to their child’s spouse per year without facing a gift tax. That’s a total of $28,000 per person or $56,000 total per year for a couple. If the gift is recent and is for the sole purpose of buying a home, a lender needs to see a signed agreement from parents stating that they have given their child a specific amount of money as a gift and don’t expect repayment. In this situation, a lender wants the buyer to prove the origin of this new lump sum of money, which is usually put toward a down payment. The lender needs to fully understand any borrower’s complete finances and any risks, and this letter assures them that you are under no obligation to pay back this gift. Parents or a family member can send the money directly to the settlement agent. That amount needs to match the amount stated in the letter. Many family members who lend money this way are happy to know that they are helping you buy a home and have some control over where the money is going. If you and your parents are really organized, the tax-free gift giving can start earlier. With some preplanning, your parents can each gift you $14,000 per year over several years into an account in your name. Or double that if you’re married! In this situation, the gifted money can become more “seasoned” in your account, well before you even start looking for a home or begin working with a lender. It essentially becomes your money, and no lender letter is required down the road. However, the potential downside for your parents or other family members is that they now have no control on how you spend this money. It might not ever be used for a down payment on a home at all. It’s really up to you. But that’s a serious family discussion that you need have if you all decide to go this route. It’s important that everyone understands all of the potential scenarios to avoid any family regrets over this gifted money or early inheritance. 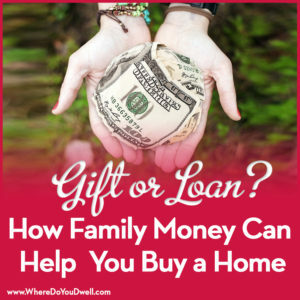 Rather than gifting money, a family member can lend you money to purchase a home. That means you do have an obligation to pay back this money. The benefit of an intrafamily loan is that you can get a lower interest rate than what’s currently available for a 30-year fixed rate mortgage loan. And, your parents can earn more money on the interest from this loan than if their money was in a CD at their local bank. See how it can be a pretty good financial transaction between you and your parents or between you and another family member? Keep in mind, there are certain strict requirements you and your family must abide by so you don’t face any gift tax or income tax penalties. You should meet with a real estate attorney to draw up loan documents and set up appropriate rates, payback requirements, etc. The interest rate your parents give you must meet the IRS’s applicable federal rate (AFR) for an “arms-length” transaction. It must be higher than the current AFR when you initiate your loan. Don’t worry, the monthly APR rate recently has ranged around 2.7% for long-term loans … much, much lower than the current bank rates. So if you don’t qualify for the best rate from a bank, then maybe a family member could agree to lend you money at a lower rate — at 3% or 3.5% — to cover some of your mortgage or all of it. Plus, this loan won’t have fees, points, or mortgage insurance that can increase costs for you. And since this loan is considered a mortgage, you’ll still get to claim a mortgage rate deduction on your taxes. Another win for you! One of the benefits of this scenario is that your parents will earn some money from this intrafamily loan. This is especially good for those parents who can’t afford to gift money and still need money to live on. They will need to pay income taxes on this money earned, but they’d have to do that on a CD too. Please contact us with any questions about having family members help with financing your home purchase. Many buyers have done this before and we can give you more guidance on family gifts and loans. What if you don’t have enough down-payment funds AND can’t (or don’t want to) get help from family? Consider borrowing from your 401k. It’s an option worth looking into and you can read all about it right here (released February 7th).